There is a reason they are called elaborate. THE Wrestling Federation (as in the one and only) knows how to choreograph the arrivals—the elaborate entrances—of their biggest stars for each showcase bout. Macedonio “The Mace” Guerra is not one of them. 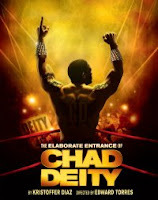 His job is to be our narrator and to get body slammed by THE’s reigning champion in Kristoffer Diaz’s The Elaborate Entrance of Chad Deity, which opened Off-Broadway at the 2nd Stage Theatre on May 20th. A mere stone’s throw from Times Square, the 2ST is the perfect location for the flamboyant title character of Elaborate, recently transferred from the Windy City. When Deity enters the ring, it is not simply a matter of a few high fives and a bit of preening. It is a full multimedia production. Guerra does not get that. His job is to lose, unceremoniously. Yes, it is shocking, but true: THE Wrestling is fixed, but Guerra has no problem with that. After all, he has a deep appreciation for the sport’s traditions. Guerra is also okay toiling to make Deity and his potential contenders look like credible wrestlers, while racking up a dismal record and a host of aches and pains for his troubles. He is just happy to have attained a small stake in the American dream. However, THE boss Everett K. Olson’s horrendous racial insensitivity occasionally gets to him. While he usually lets it roll off his back, issues of ethnic identity and pride come to the fore when Guerra recruits Vigneshwar Paduar into the league. While Guerra envisions Paduar as a trash-talking Hindi urban warrior, Olson transforms him into The Fundamentalist, recasting Guerra as his Latin American Marxist sidekick. Adopting to their roles only too well, Guerra and Paduar deliberately try to subvert Olson’s program while staying resolutely in character, thereby establishing the play’s dramatic conflict. Of course, wrestling is certainly involved, courtesy of fight director David Woolley. However, the Fundamentalist’s matches do not last very long, thanks to his signature take-out move, the newly rechristened “sleeper cell” kick. Indeed, his scenes in the ring are quite cleverly conceived, avoiding most of the predictable sports clichés. There is certainly not a big climatic championship bout—remember, it is all still fixed. There is an impressive degree of physicality displayed by the mostly cut cast. As Deity, Terence Archie certainly looks the part, entering the ring with flying slides and pile-driving poor, hard-working Guerra into the mat. Though lacking the rippling physique, Desmin Borges is a truly charismatic narrator, bringing to mind Lin-Manuel Miranda in the vastly different In the Heights. The irony is that audiences who would be most inclined to enjoy a pitch-perfect play about wrestling are also likely to be put off by its ideologically-charged content. While Diaz constantly decries ethnic typecastin g, Elaborate engages in wholesale stereotyping of wrestling audiences, clearly implying that they are unsophisticated, borderline-intolerant rubes from flyover country and using the terms "patriotism" and "jingoism" interchangeably. Such distractions are a shame, because Elaborate looks great. The entrances are a sight to behold, incorporating video footage shot on the city streets outside the Second Stage, played on the giant jumbo-tron screens above the onstage ring. Director Edward Torres keeps the energy level amped up, so that the play never feels talky or self-consciously stagy, despite the constant narration. Unfortunately, the fight for our sympathies in Elaborate is so obviously fixed even THE Wrestling would find it problematic. Still, it is a real feat of stage craft, worth checking out during its engagement at Second Stage Theatre, ending June 20th.